Too many people are finding life complicated, overwhelming, and less than satisfactory. As the article suggests, people “stick their heads in the sand” rather than facing the on going challenges and demands. I noticed this in my personal life last year when I missed a few payments, as demands and life challenges spiraled out of control. That was my first cue and a wake up call to the overwhelm hidden in my apparently “I’m okay, I can get through this” attitude. 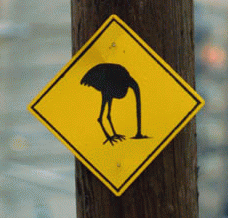 If you’re not sticking your head in the sand, we might find yourself wanting to run! Yes, the flight -flight response is still very real, just that we store it up, don’t take appropriate measures to relieve it, and eventually burnout. The overwhelm to burnout shows up in subtle and not so subtle ways. The thing we need to be aware of is, being in this state of high demand and complication is not sustainable, highly counter-productive, and impacts quality of life and business. So what can you do? My initial response – build some personal and professional strategies to become proactive and consciously aware. Too often we run on behaviours and habits that no longer serve us; and yet, find it too draining to consider other options. You don’t always know just how creative and resourceful you are – you’re too tired! In comes, the “coach” – yes that’s moi! I don’t profess to know every strategy to help you better manage, but I do help you get crystal clear on what’s getting in the way and where you are far too comfortable to change! Understanding the complexity of our lives also implies there are no quick fixes, but rather, challenging one to truly consider what’s valuable, important, and meaningful. It’s helpful to have some strategies and I might suggest that one begins by aligning their priorities with their values, or aligning projects with meaningful work, but ultimately, you need to be in the driver seat, taking control of the changing landscape and being for a few sharp curves and twisty turns. This starts with awareness and your readiness to look at yourself and how you want to live. The same holds true for business – whether you’re managing your own business or leading an organization, it’s valuable to be aware and strategic about how you conduct yourself and your business. The impact on your relationships is significant and really isn’t that a major part of living – having quality relationships and engaging our greatest strengths and capacities? Take your head out of the sand, you can live life in a more direct, engaging, and simple way. It just requires a little willingness to look within, notice what’s not true for you, and how you want to be. It’s easy be overwhelmed, we’ve been programmed to produce, compete, and keep up. Surely we all strive for a good return on our investment – so why not invest in you and your life first? The rest, will follow.